Judo, karate, kendo, aikido—most of the Japanese martial arts, as practiced today, are relatively recent inventions, taking shape in the era of Japanese nationalism, military build-up, and expansion following the Meiji Restoration. Their forms reflect their times: They are characterized by regimented group practice, a focus on building spirit, an emphasis on competition, and strict systems of ranking. Contrast this with the koryu bujutsu, which are, broadly defined, the martial arts of pre-Meiji Restoration-era Japan. Rather than the hierarchies of the “gendai budo,” including governing bodies, the koryu are passed down in ryu, semi-feudal “family” traditions, and their pedagogical method is completely different. The late, great Donn Draeger was the first Westerner to bring widespread attention to the koryu bujutsu. Yet, Draeger’s writings presented only one point of view of a complex subject, and left many misconceptions, such as the oft cited “-do” versus “-jutsu” controversy. Diane Skoss, like Draeger, is a writer who spent many years living in Japan, drinking from the wellspring of these rare arts. Unlike Draeger, her books combine a multiplicity of voices, being composed of essays written by eminent authorities on the classical Japanese martial arts. 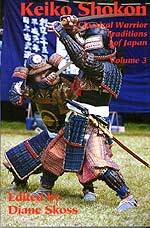 The first book in Skoss’ series, “Classical Warrior Traditions of Japan,” sought to define what the koryu bujutsu are. The second tried to approach the essence of these arts. Her third book, however, is concerned not with the past or present, but with the future. What lies ahead for the koryu bujutsu in a world grown increasingly impersonal and mechanized, where “martial arts,” to many Japanese, means high-school Phys Ed. kendo, and in which many of those most interested in learning these arts are, in fact, non-Japanese? Can the koryu be successfully transplanted to foreign soil? Does their spirit change? Essays in this book include a Japanese parable on the nature of skill in the fighting arts, translated by Karl F. Friday; an essay by Dave Lowry on the dangers of attempting to study more than one koryu (which should be required reading for anyone purporting to follow a regimen of “cross-training”); Liam Keeley’s interview with Nitta Suzuyo, the headmaster of the Toda-ha naginata ryu; Ron Beaubien’s insightful observation on the difficulty of trying to leanr about the koryu by mere observation; an overview of the methods and practice of Itto-ryu kenjutsu; a discourse by William M. Bodiford on what exactly the often-misused term “soke” actually means; Ellis Amdur’s essay on the perils of trying to improve on centuries-old traditions; and, finally, United States Marine Corps Lieutenant Colonel George H. Bristol’s observations on the koryu as fighting arts and combat training. well worth considering in and of themselves. This book is highly recommended. Ken Mondschein, is a New York City writer and amateur historian. After achieving a masters degree in European History he became a student of classical fencing and historical swordsmanship under Maestro Ramon Martinez. He is also knowledgeable about European classical dressage, the art of horsemanship, and its history and application in mounted combat. Other martial arts studies include karate where he is now a student at the World Seido Karate Organization's New York City headquarters. Mondschein currently works in textbook publishing and is Associate Editor for European Sword Arts for FightingArts.com.